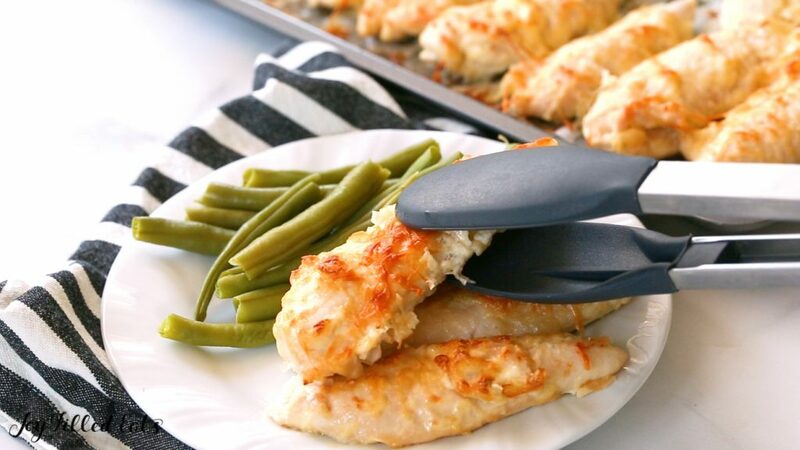 With just Five Ingredients and Five Minutes of prep time, these Garlic Parmesan Chicken Tenders will be your new easy dinner. This is our favorite easy Chicken Tenders Recipe. It can be difficult to make simple staples taste good quickly. My Five Minute Garlic Parmesan Chicken Tenders do just that. With a five minute prep time, you can pop them in the oven and help kids with homework, get a couple chores done, or just sit back and put your tired feet up. 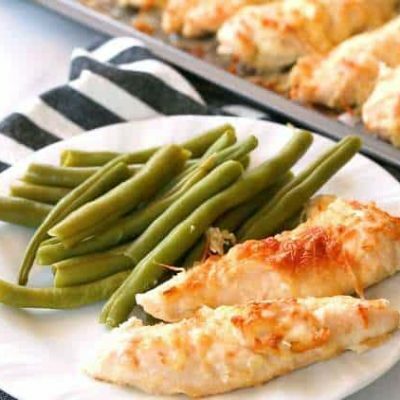 Chicken tenderloins are my favorite meat for quick dinners. They cook fast and don’t require cutting or trimming first. Since chicken doesn’t have a ton of flavor on its own you can incorporate them in hundreds of ways. This recipe has the same topping I use on my Garlic Parmesan Zucchini. It is a family favorite and I knew it would also be great on chicken. My kids gobbled this up. I must say it is awfully hard to type while holding a baby. If my posts are a bit less wordy than normal that is why. My sweet 7-week old boy is such a blessing but he loves to be in mama’s arms. I wear him in baby carriers often but he’s happier if I’m moving around doing chores than sitting and typing. Creating recipes and taking photos is easy, even editing since I can click with one hand, but two-handed typing, not so much. Mayo is my favorite condiment ever. It takes almost any savory dish and kicks it up a notch. 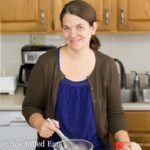 It is my go-to for making anything dairy-free creamy. That delicious emulsified oil can replace cream in many recipes. It can be difficult to make simple staples taste good quickly. My Five Minute Garlic Parmesan Chicken Tenders do just that. With a five minute prep time, you can pop them in the oven and help kids with homework, get a couple chores done, or just sit back and put your tired feet up. This is one of my favorite chicken tender recipes. Combine the mayo, 1/4 cup of the cheese, garlic, and salt in a medium bowl. Add the chicken and stir to coat. Put the chicken on a large baking sheet. I put parchment on mine to save on the cleanup. Sprinkle on the rest of the cheese. Bake for 25-30 minutes until the chicken is cooked through. Optional: Broil for 2-3 minutes to brown the cheese. Watch the chicken closely if you are broiling so it doesn't burn. Watch the video right above this recipe to see how easy these are to make! Originally published 11/3/17. Revised and republished 10/24/18. I made this some friends last weekend and was SO good. I've shared the recipe with 4-5 friends so far. I didn't change a thing, so moist! Could I swap out for mozzarella cheese? If so how much do you think? Yes, but they won't get as crispy. Probably the same amount. Yum! This tastes fantastic, and I love how easy it was! The chicken was incredibly moist too. My family and I are going to start camping this summer, and I was wondering about turning this into a foil packet meal? I have no experience with cooking in foil packets and would love any tips from anyone who has camped if it would be possible with this recipe. Most of the foil packet recipes look the same to me and have starchy veggies in them, so I'm hoping to find some lower carb (and tastier) alternatives. Thank you! My family makes foil packs all the time while camping and this would be perfect for a foil pack meal. We usually add cauliflower and zucchini to our foil packs too. My son loves putting all sorts of veggies in his foil packs. How many chicken tenders for one serving? Hi Nina, that depends on the size of your chicken tenders. Just count how many and divide by 8. It should be 3-4 per serving. My whole family loved this recipe. The first time I made as written and it was wonderful. Husband doesn't love mayo so the next time I did a mix of half mayo and half full fat sour cream. That time I also added some dry Ranch powder and used half parmesan and half cheddar cheese. Delicious! This recipe is so quick to make and so easy to customize. Next time I am going to try it with some cajun seasoning with parmesan and cheddar or possibly some oregano and thyme with parmesan and feta. lol The possibilities are endless! One note - it took about 25 mins in my convection oven so watch your time and use a thermometer if you have one. Thanks so much for your amazing blog! I made these last night. They were absolutely delicious, but there was so much oil left in the pan after making them! The tenders were swimming in oil. Just wondered why this is and if it's normal. I used Kraft real mayonnaise. That's not normal. I wonder if it was the kraft mayo. I normally use just mayo. Mine also had a lot of oil in the pan about half way through cook time, so I just drained the oil off and put back in to finish. I make my own olive oil mayo and used that. Great recipe, thanks! Each serving has over 1 tablespoon of mayo and parmesan cheese. A friend share this recipe on Facebook. That started a journey through your blog and found many jewels. Making this recipe for dinner tonight. Know it will be delicious. There are actually 2g of carbs in a tsp of garlic powder. For anyone on keto or keeping track of carbs in general, you should also pay close attention to carbs in your seasonings. Still a great low carb option! Cant wait to try this recipe. Made this for dinner tonight! It was super yummy and a big hit with both my guys! Love, love love this! Started Weight Watchers today and need to figure the points! My family loved it! Shannen, The cheese is the points? what is the serving size? You can substitute 0% milk fat greek yogurt for the mayonnaise! Hi. Would these still be good reheated as leftovers the next day? Yes, we enjoy them as leftovers (if there are any left 😀). This was great! Gave some to family and they messaged me wanting more...Thanks!! Love, love, love this recipe! Even my two picky eaters ate it. Definitely will be making this again. Probably ones a week. So easy and delicious! Thank you for sharing! Hey Taryn, I can't wait to try this for my family!! My question is what kind of mayo did you use? I just wanted to make sure to get the right kind!! I normally buy Just Mayo but any mayo should work. Probably. 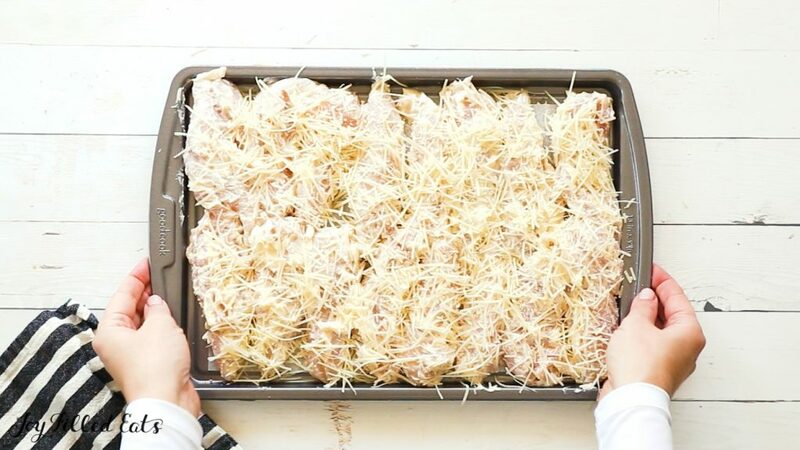 You just need something to hold the parmesan to the chicken. I made this tonight and used miracle whip and it was a huge hit. Miracle Whip is not mayo. It's 'salad dressing' (whatever THAT is), and has added sugar. Use Best Foods (AKA Hellman's). Hi Sandy, you tried this recipe with sour cream? This recipe is awesome! My husband was the chef of the family and now he is working extended hours, I have to cook. Usually I get comments from my fussy eaters that dad's was better. 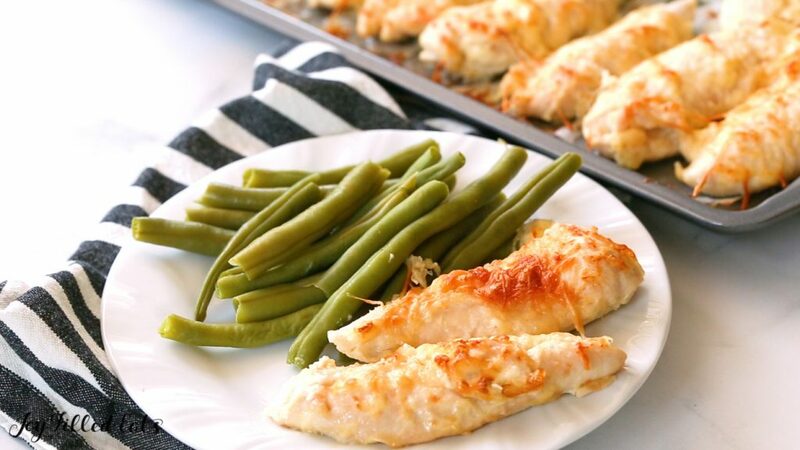 Tonight with this recipe, my children are all their chicken and my pickiest eater had seconds. Thank you! Could you cook these in an air fryer? I'm sorry but I haven't tried it. You would have to half the recipe or they wouldn't fit. I think it would work. Taryn this looks Amazing! !I do have a question. The recipe calls for 3/4 cup shredded parmesan cheese, divided. I don’t have any of this and, my family doesn’t care for it but, they like the bottled Kraft Grated Parmesan cheese (sprinkle cheese as they call it). 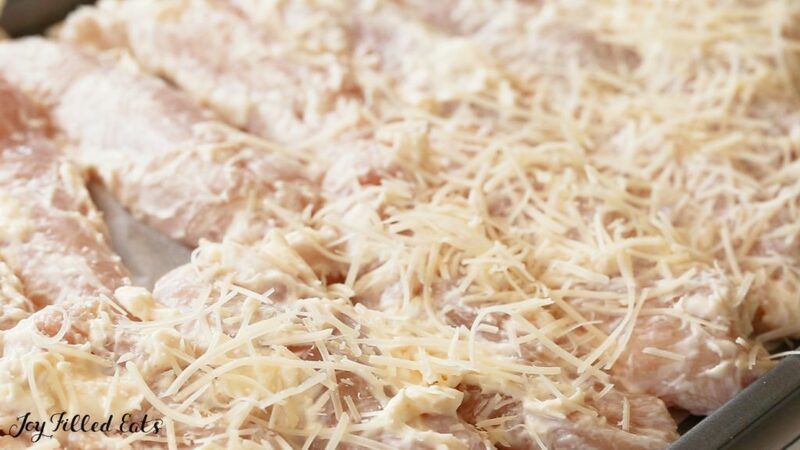 Is it possible to substitute the shredded for grated and how much would you recommend to use?Or should I substitute the shredded Parm for shredded Mozzarella cheese instead?Thanks for any help and advice. Your recipes are Amazing. They are helping me lose weight and feed my family healthy meals. My kids call it sprinkle cheese too 😀 I would use about 1/2 cup so these don't turn out too salty. Can you use this recipe on chicken breasts as well? Yup! They will take longer to cook though. Just make sure to cook to 160 degrees. I temp at 20 minutes and then every 5 minutes after that until they are done. Thank you for all the low carb foods. I enjoy all of them. Love this recipe. Thansks for sharing!! I used 1/4 cup mayo and 1/4 cup parmesan cheese and no salt. Turned out great! 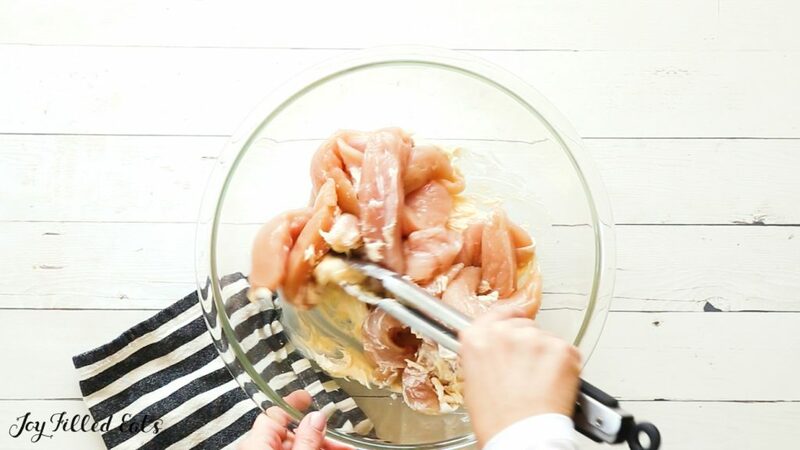 This chicken tenders recipe has 0.5 carbs per serving, there are 8 servings in the recipe. Can you substitute anything for mayo?? The mayo acts like a binder to hold on the parmesan. You can substitute a beaten egg as a binder instead. Or maybe a little soft cheese such as cream cheese or ricotta mixed with egg. But the mayo gives it a nice creamy flavor. I don’t have time to run to the store, would shredded parmesan work just as well? So easy and quick to make!!!! I love your recipes however am on a under 15 carb per day and some of your recipes say low carb but does not tell me how many. Can you help me. I am working through all of them updating nutrition facts. But it takes time to do 400+ recipes. If you have a specific recipe you'd like the info for just leave a comment and I'll do that one next. 5 minutes meals are the BEST! Plus my kids would love this one. I love an easy recipe that comes together in no time. Never had thought of using mayo though, looks really good! Hi Jenny, that depends on the size of your chicken tenders. Just count how many and divide by 8. It should be 3-4 per serving. Hmm, I have stopped purchasing bottled mayo, and it was a flop when I tried to make some with olive oil! Is there anything else that would substitute? I'm not sure. Maybe cream cheese.